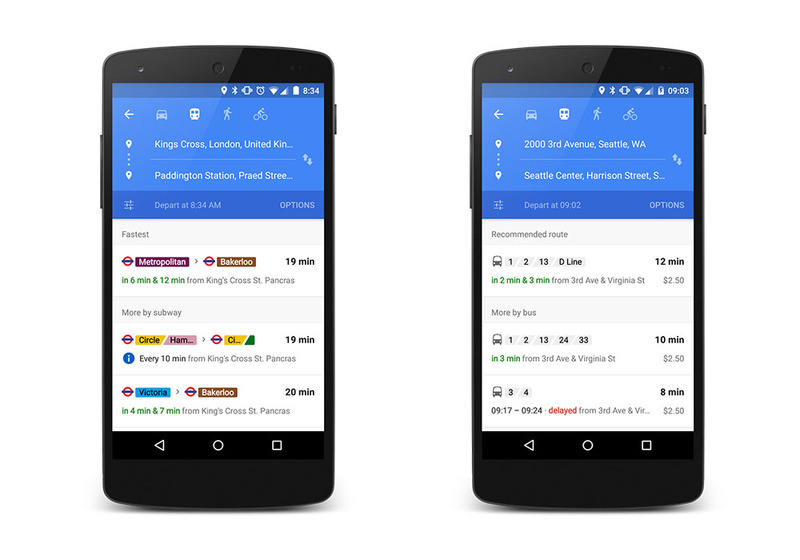 Google announced today that Google Maps and its real-time transit info is now available in four new metro areas, but also that “relevant journeys are handily arranged and summarized in the app.” Google doesn’t want you to miss your ride as you guzzle that “last sip of coffee,” but should you, these new summaries will help you always find another option. To see what the new summaries will look like, take a look at the images above. As for real-time transit info, Google unfortunately, did not specify which new metro areas would start to see it. They did mention that they are also working with 25+ new partners to make real-time transit info a possibility in the UK, Netherlands, Budapest, Chicago, San Francisco, and Seattle, though. For those new to real-time transit info, just know that when it is live in your area, transit info in the Google Maps app shows live, with arrival times for busses, metros, and subway systems. As routes are cancelled or delayed, you are able to quickly make decisions on your best possible route. Tough to tell if this is real-time action will arrive via update or behind-the-scenes, but I’m going with the latter.